At the Costello household grilling is not confined to the summer. Partly that’s because of D.C.’s temps and partly because we have a gas grill close to the kitchen. For me it’s also nice to get Patrick involved in the cooking (though there has been some quibbling if just adding fire to something qualifies as “making dinner”). 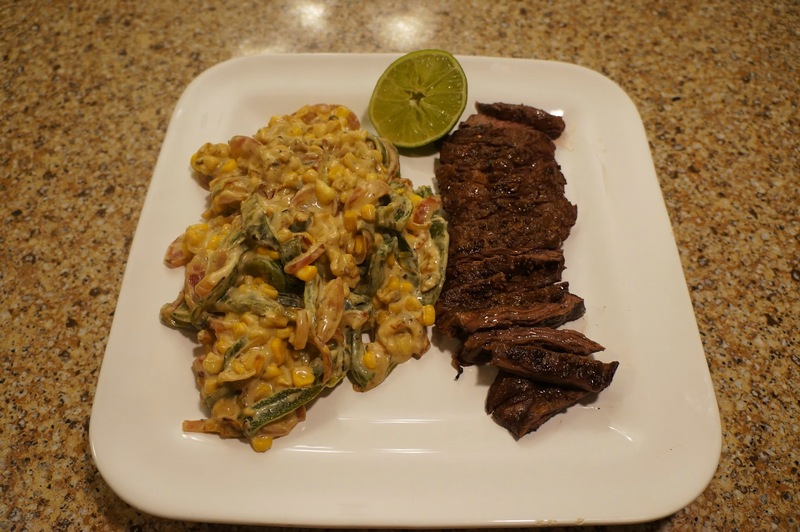 This meal is great year round – even if it’s snowing, the steak takes almost no time to grill and the veggies are pretty much seasonless (fresh corn would be way better but frozen is just fine). It’s not the prettiest dish you will find on this blog but it’s delicious and satisfying. I have served it with rice or quinoa on the side or chips and guac. If you want to go really crazy you could stuff both the steak and rajas into a tortilla and have taco night all set. Ok now you are asking – what the heck are rajas? In Spanish it means strips and usually in latin cooking it will mean strips of poblano peppers but really they could be any pepper. If you haven’t tried poblanos you really owe yourself to grab one. Most supermarkets seem to carry them these days, they are green but longer and thinner than regular green bell peppers (which I abhor). They have a medium heat (more than bell, less than jalapenos) and terrific flavor. Often, like in this recipe, they are roasted, skinned, seeded and cut into rajas. 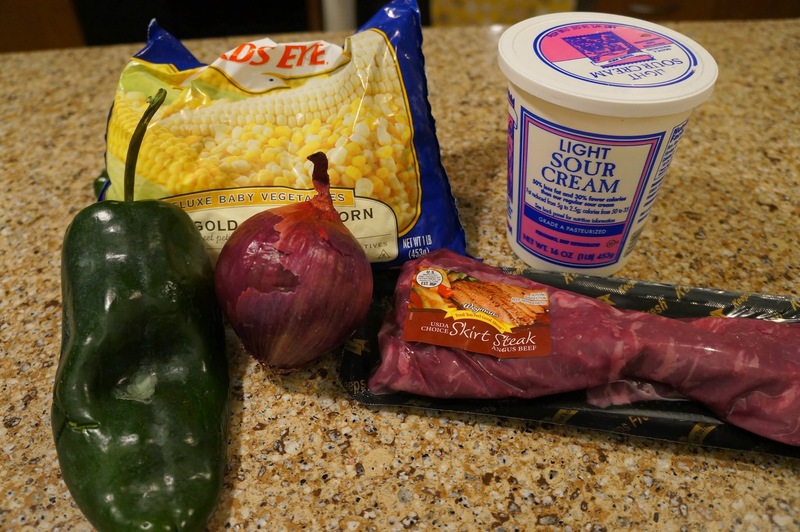 They are also great for stuffed peppers (chile rellenos). Once you have tried them they will become a new permanent member of your veggie drawer. This is the first official “Fiesta Friday” post – yes Monday’s post was also Mexican themed but that was just because of Cinco de Mayo. 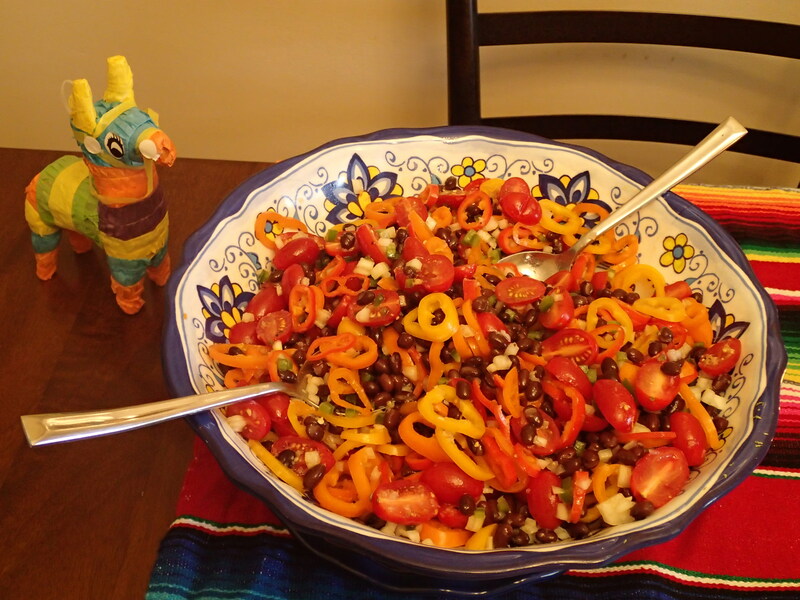 Fiesta Friday is celebrated almost every week in our house. We have found the best way to usher in the weekend is with food that makes you happy – ie spicy and flavorful. After a long week a nice mojito and some fried plantains sounds good right? This has caught on with several of our friends and I hope you all try and spice up your weekends as well. 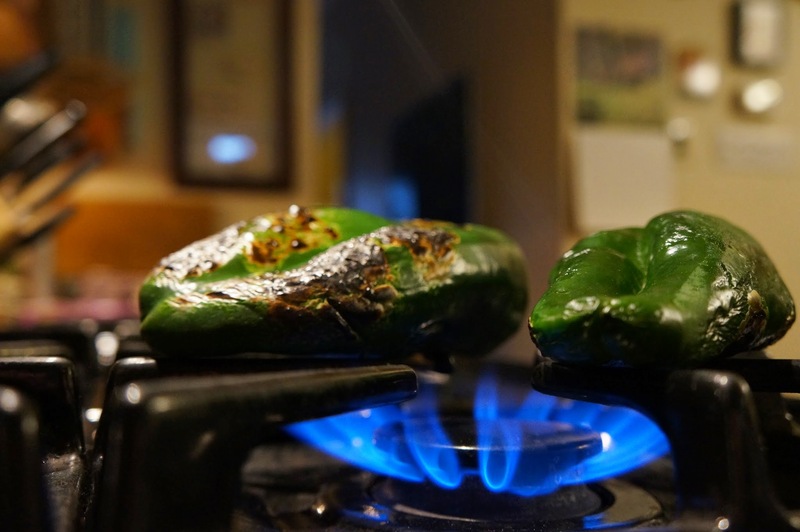 First to make the rajas you want to roast the poblanos directly over a gas flame or under a broiler. I use the direct gas flame method but if you want to ensure all the skin and char get off I recommend the broiler as more heat and steam circulate around the pepper that way. If you do it on a gas stove top, just put the peppers on top of the burner. Make sure you removed the stems (just pull them off) as those always seem to be the first thing that catches fire! Jack the heat up and then just keep an eye on them. You honestly cannot ruin these peppers, in fact you want to burn them. If using a broiler just throw the poblanos on to a sheet pan and put it under the broiler set to high. For both methods just keep turning until all sides are blackened, about 10 minutes. It feels totally crazy to just throw your food on the fire but its the best way to go, I swear. 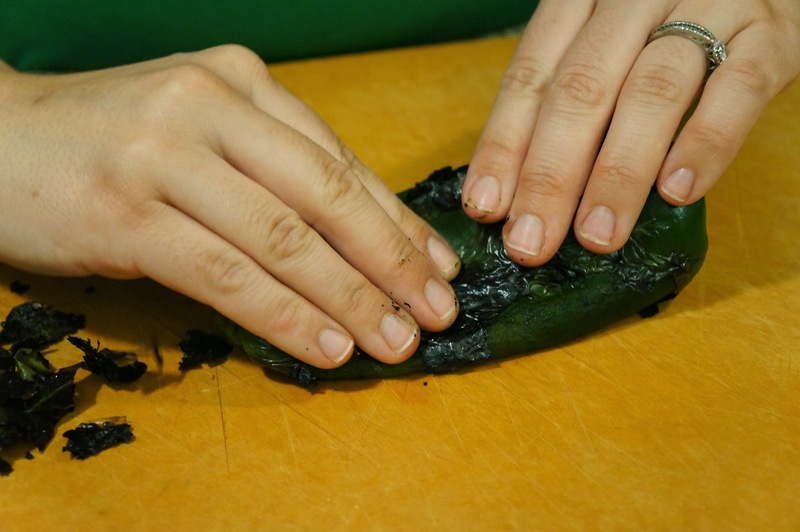 Transfer the poblanos to a bowl and cover tightly with plastic wrap. Let the peppers steam in the bowl for around 10 minutes. The steam magically losens the skin from the flesh. 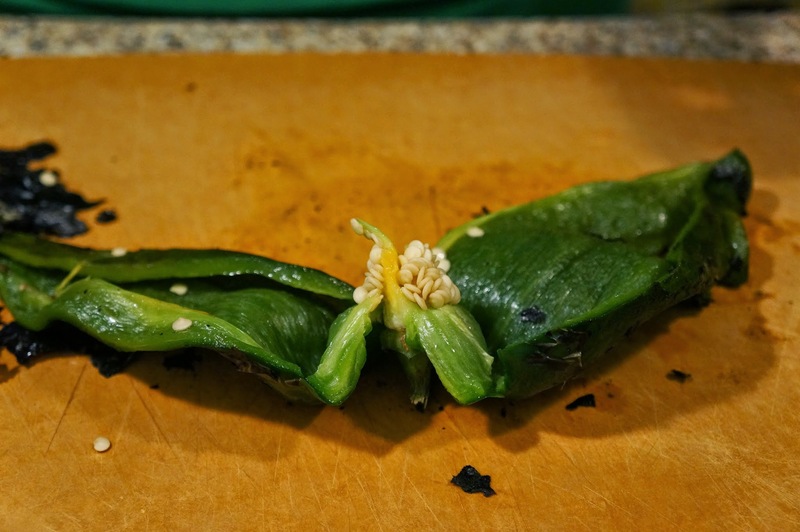 Then all you have to do is rub off the skin, cut open the pepper, discard the seeds and cut into rajas. As I said, my gas method will not be perfect but I like the bits of char that are left behind. If you want you can make the rajas in advance and just keep them in the fridge for a couple of days until you are ready to use them. At this point you should heat up your grill on high and season your steak with salt and pepper. Always take steaks out of the fridge at least 30 minutes or up to an hour before you are ready to cook them. Super cold steak on a hot grill or pan means a tough steak. In a medium saucepan, heat 2 tablespoons of olive oil over medium high heat for a minute. Then add the onion and cook until softened, approximately 5 minutes. 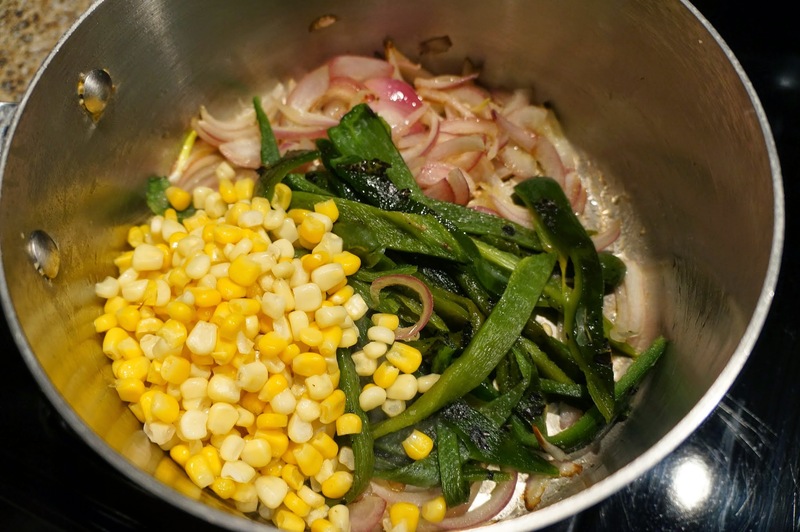 Add the corn and rajas and cook for another 2 minutes. Take off the heat and then stir in the sour cream and season with salt and pepper. The original recipe calls for a lot more sour cream but I just don’t think its necessary. Keep the corn salad warm over very low heat. Throw the steak on the grill and grill 4 minutes one side, 2 minutes the other for medium. 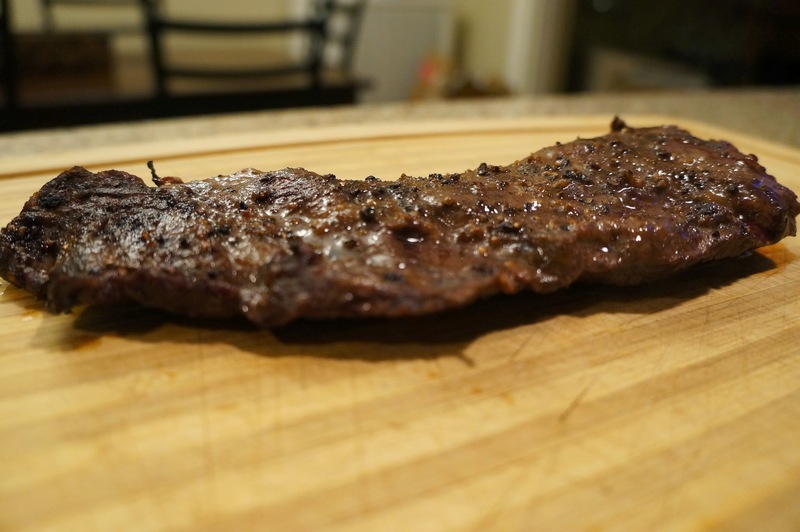 Skirt steak is pretty forgiving so if you go longer the fat in the cut will keep it from drying out. Then just let it “rest” for 5 minutes which means put it on a cutting board covered in tin foil to let all the juices get back into the steak. Slice and serve with the rajas salad on the side. 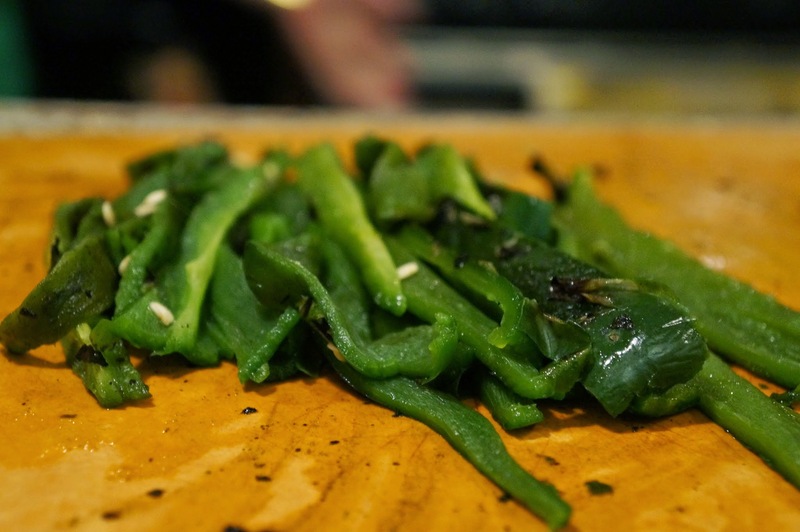 First to make the rajas you want to roast the poblanos directly over a gas flame or under a broiler. If you do it on a gas stove top, just put the peppers on top of the burner. Jack the heat up and then just keep an eye on them. If in a broiler just throw on to a sheet pan and put under the broiler on high. For both just keep turning until all sides are black, about 10 minutes. 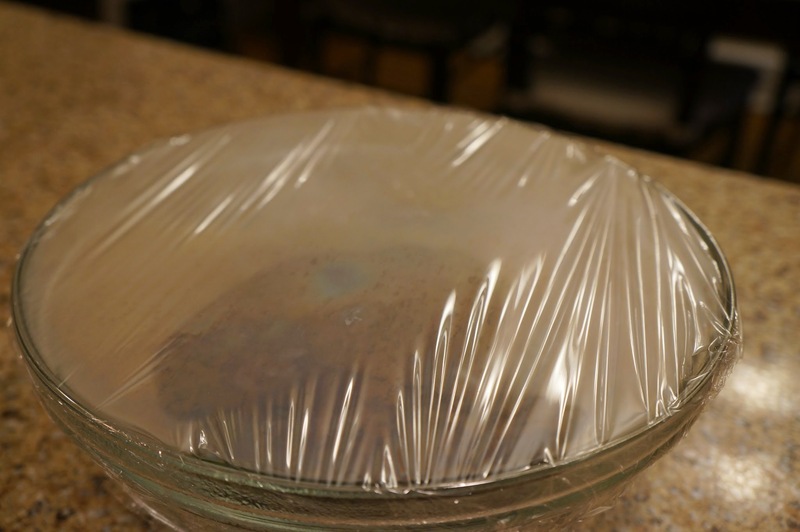 Transfer the poblanos to a bowl and cover tightly with plastic wrap. Let the peppers steam in the bowl for around 10 minutes. Then all you have to do is rub off the skin, cut open the pepper, discard the seeds and cut into rajas. If you want you can make the rajas in advance and just keep them in the fridge for a couple of days until you are ready to use them. At this point you should heat up your grill on high and season your steak with salt and pepper. In a medium saucepan, heat 2 tablespoons of olive oil over medium high heat for a minute. Then add the onion and cook until softened, approximately 5 minutes. Add the corn and rajas and cook for another 2 minutes. Take off the heat and then stir in the sour cream and season with salt and pepper. Keep the corn warm over very low heat. Throw the steak on the grill and grill 4 minutes one side, 2 minutes the other for medium. Then just let it “rest” for 5 minutes which means put it on a cutting board covered in tin foil to let all the juices get back into the steak. Slice and serve with the rajas salad on the side. Spring has finally sprung in D.C. For me that means I get down to the farmer’s market as quickly as possible to see what’s growing. After suffering the laughable produce in grocery stores all winter I was ready to see fresh spring produce. Unfortunately, the H Street Farmer’s Market was still pretty bare last weekend but I am sure over the next couple of weeks there will be more selection. However, a beautiful bunch of asparagus and some lovely spring onions caught my eye. I didn’t have a plan for them, in fact I had a week’s worth of menus already planned that didn’t include either but that’s the joy of the farmer’s market. Grab whatever looks best and make it work. I decided I wanted to cook them together, both being so green and springy. Usually with asparagus I just roast them with olive oil, salt and pepper at a high heat but that would kill the flavor of the spring onions. Instead I opted for a method my mom and I experienced at a restaurant in Chicago – asparagus coins. I believe Thomas Keller does this as well so if its good enough for him, good enough for me. 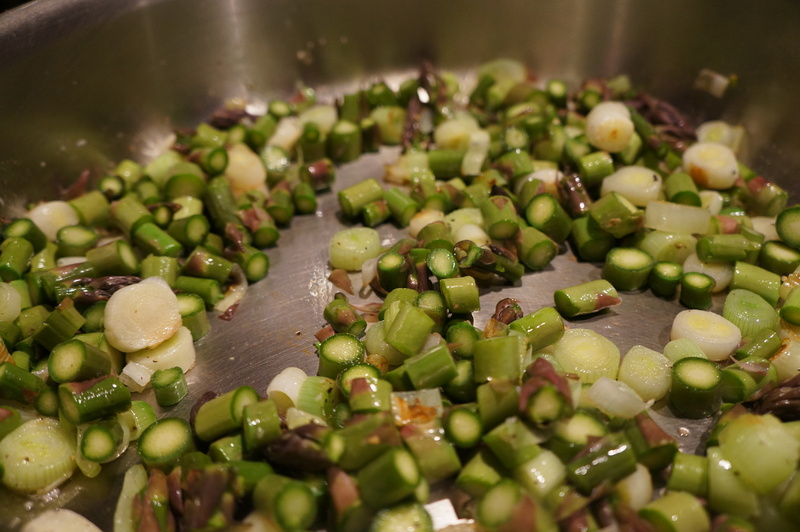 Basically you cut the asparagus in small bites and saute – I experimented with adding the spring onions and braising them in a little white wine. It got the husband thumbs up and was deemed blog worthy. Vegetables are a great place to start experimenting if you are nervous about not using a recipe. No one ever died from an undercooked broccoli stalk (to my knowledge) and overcooked veggies aren’t great but edible. Think about the vegetable you are using and what flavors would work well with it. Start easy with the most established produce relationships – tomato and basil, green beans and ginger, spinach and garlic, squash and pie spices. Then keep adjusting until you have something just how you like it and voila – an easy side you can make any time that doesn’t send you running to a cookbook. If I make these coins again I would probably add a little garlic, or maybe some grated parmesan on top when its done. Take the asparagus and snap off the woody part at the bottom. If this isn’t something you have done before you basically grab the spear at either end and bend it until it breaks. That is where the tender part meets the woody part. 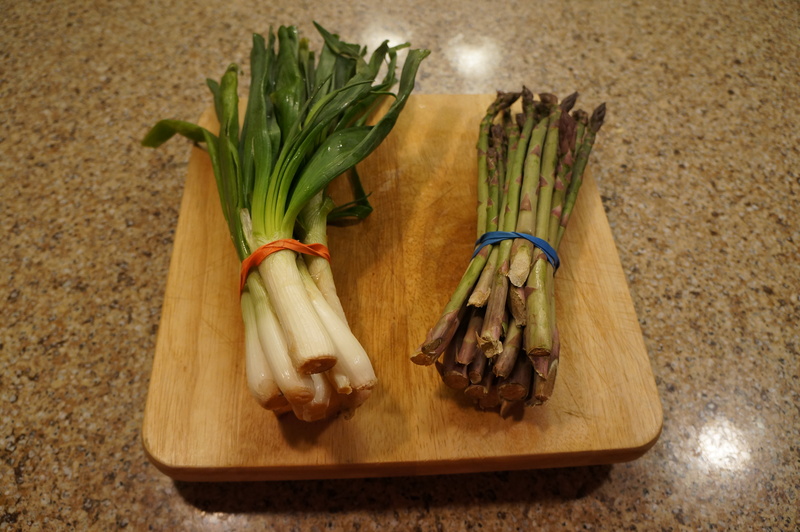 It’s a shame to get rid of those ends – if you want to get some use out of them then asparagus soup would be a good place for them to go. 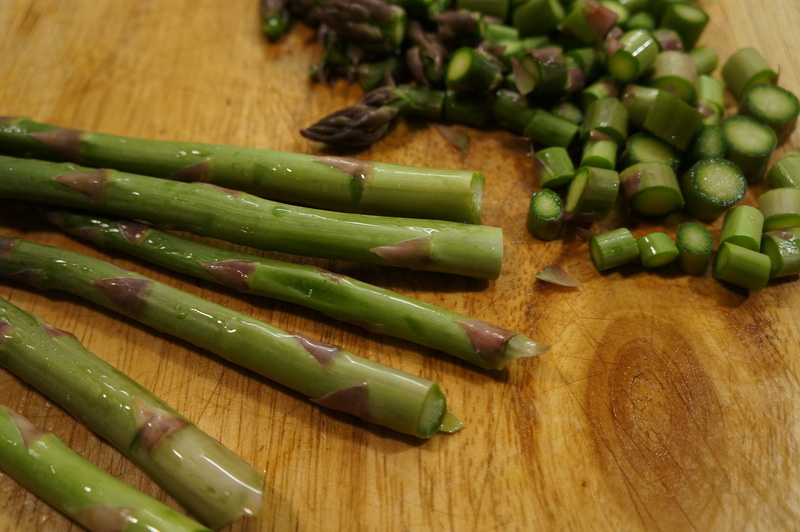 Cut the asparagus into “coins” – basically cutting the spears in quarter inch intervals. Don’t worry too much about perfection here, just cut them into little bite size pieces. 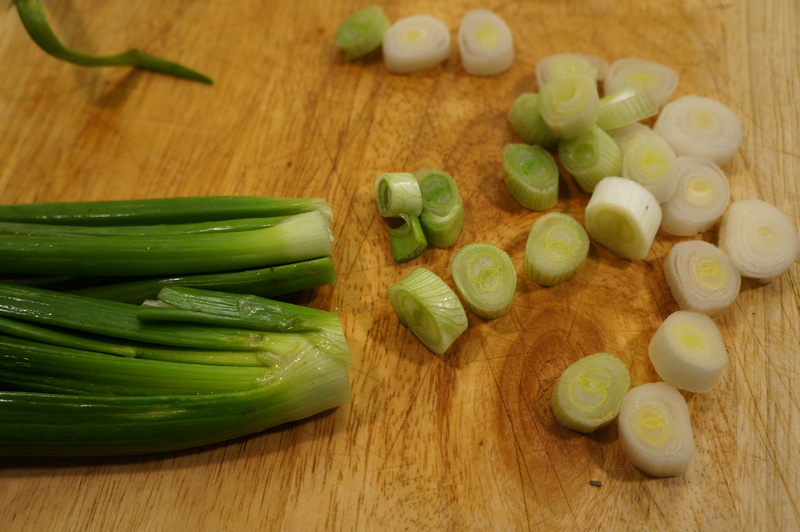 Do the same with the spring onions – white part only. Put a skillet over medium heat and add 1 tablespoon of olive oil. Add spring onion coins and season with salt and pepper. Saute for 5 minutes until softened. 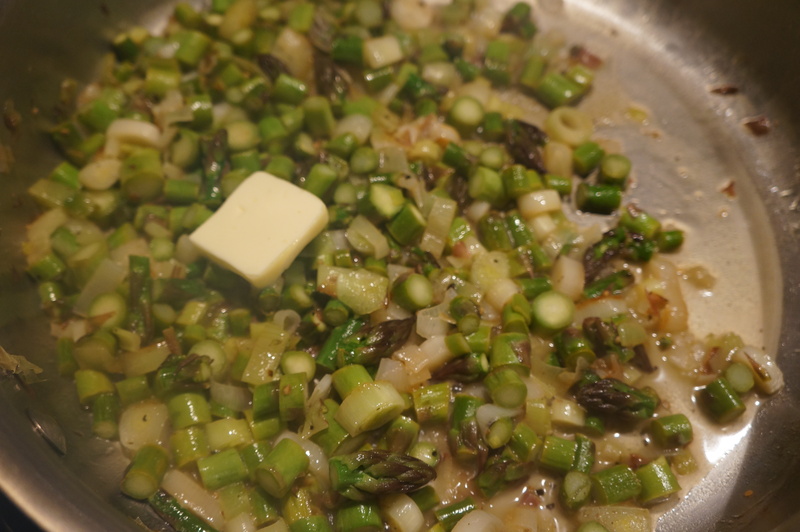 Add asparagus and cook for 3 more minutes. Add the white wine and turn up the heat to medium high. The wine will cook off and finish cooking the asparagus, about 3 minutes. When there is only a little bit of liquid left add 1 tablespoon of butter and stir in. Take the asparagus and snap off the woody part at the bottom. If this isn’t something you have done before grab the spear at either end and bend it until it breaks. 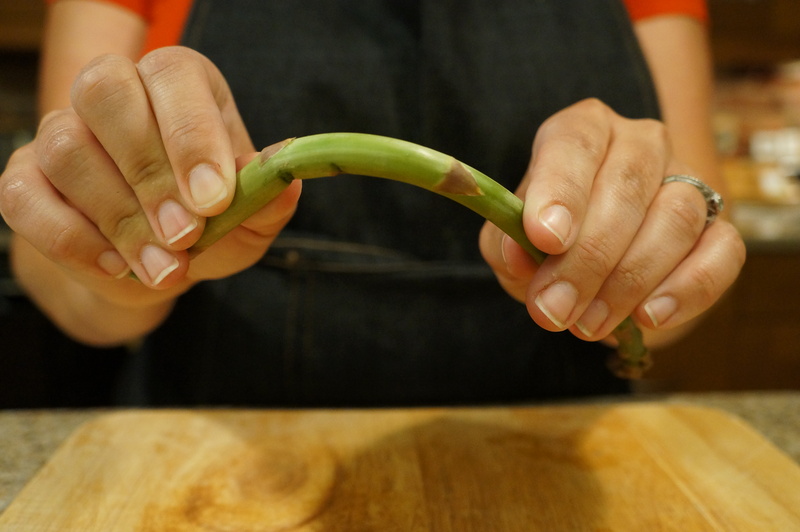 Then cut the asparagus into “coins” basically cutting the spears in quarter inch intervals. Don’t worry too much about perfection here, just cut them into little bite size pieces. Do the same with the white part of the spring onions. Put a skillet over medium heat and add 1 tablespoon of olive oil. 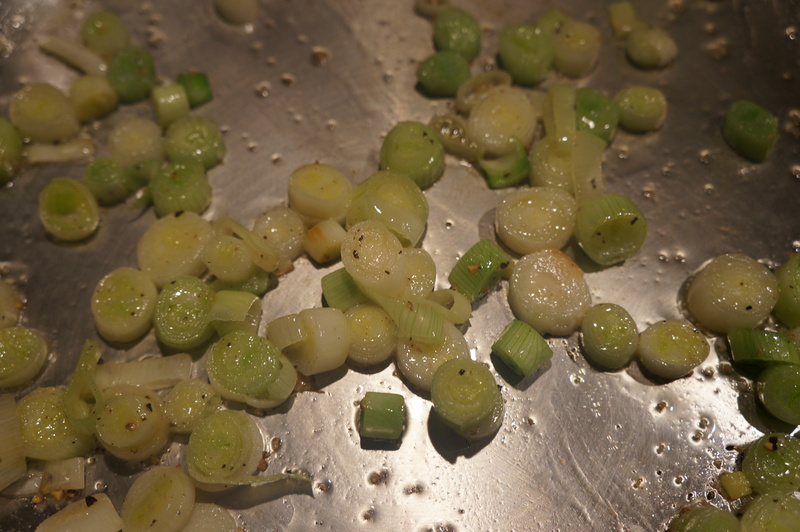 Add spring onion coins and season with salt and pepper. Saute for 5 minutes until softened. Add asparagus and cook for 3 more minutes. Add the white wine and turn up the heat to medium high. 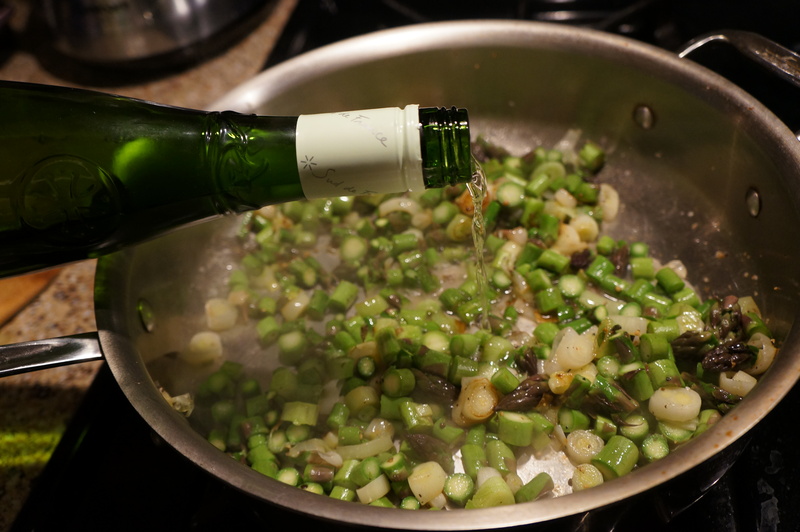 The wine will cook off and finish cooking the asparagus, about 3 minutes. When there is only a little bit of liquid left add 1 tablespoon of butter and stir in. Serve with lemon wedges and enjoy! I am so excited to get this thing going – what started as a slightly boozy idea at the Fainting Goat on New Years Day, is finally a published product. The minute I mentioned I was thinking about doing a blog my husband Patrick told me to take 60 days to conceptualize and 60 days to execute which roughly takes us to today. I would not have even imagined starting this journey without him and his incredible support. He will always be my number one guinea pig but I am glad that this forum will give me the opportunity to try out new ideas and recipes on a larger universe. My friend Ben brilliantly pointed out that if one is launching an entertainment blog there should be a party involved! 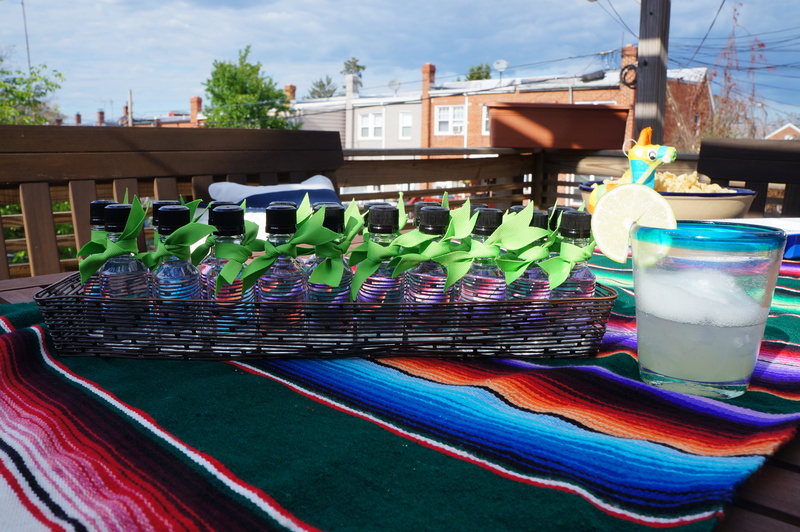 With Cinco de Mayo right around the corner we decided a fiesta with plenty of margaritas were in order. I was so glad to have my friends and family to celebrate with me. I tried to keep it pretty simple by grilling tacos and we got super lucky to have a beautiful D.C. spring day. The cookies, margarita mix, and most of the taco fillings were prepped in advance so all I had to do day of was make the cornbread, guacamole and guacamole salad and have Patrick grill the steak and chicken for tacos. 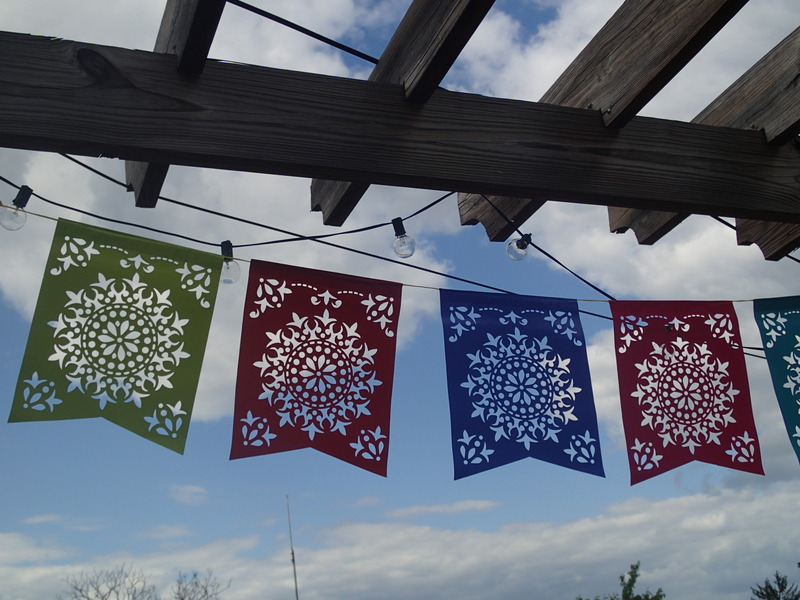 This kind of party is great for a crowd because everyone can find something they like. 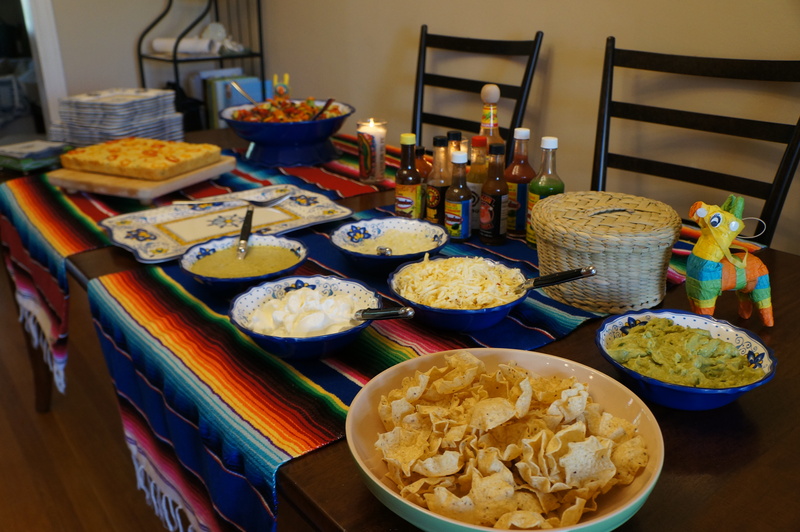 Grate some cheese, chop some onion and plop sour cream into bowls and you officially have a taco bar. Aided by the dozen or so hot sauces Patrick keeps on hand we had quite the spread and plenty of leftovers for Sunday. It’s not a party without a cocktail and for this one we went with a household favorite – Spicy Margaritas with Salt Air. If you have ever been lucky enough to go to Oyamel in D.C. you will be familiar with Jose Andres’ amazing salt air – it’s the perfect solution to getting a salty little touch with each sip of your margarita without ending up with salt crystals all over the front of your shirt. I was so happy to learn you don’t have to be a gastronomic genius to figure this out – thank you Washingtonian Mag for sharing this with the masses. I also gave out the tequilla as a favor because you never get too old for goodie bags right? People just love getting to take a bit of the party back home with them. Spicy Margaritas with Salt Air (printable version at the end of the post) Inspiration: Salt Air from Washingtonian – margarita recipe is my own Special Equipment: citrus juicer (not necessary but man will it make life easier), immersion blender – 1 habanero pepper, stemmed and cut in half – 2 cups silver tequila (or the whole bottle if you want to infuse it all) – 3 cups freshly squeezed lime juice, divided – 4 cups water, divided – 1 tablespoon kosher salt – 1/2 teaspoon soy lecithin powder (get this at a nutrition store or online, I got mine on amazon) – 2 cups sugar – 1 cup triple sec or Grand Marnier (which I prefer) First you want to infuse the tequila – I suggest go ahead and do the whole bottle as it lasts forever in the fridge and is great to have on hand. 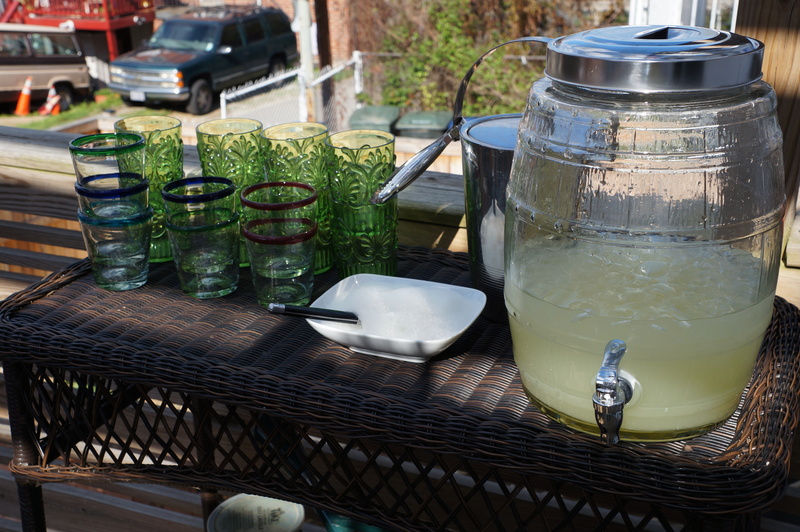 If you don’t want to go whole hog just pour out 2 cups which is what you will need for 8 margaritas. Place the cut habanero in the tequila carefully as these little peppers are HOT. I use disposable gloves whenever handling hot peppers so taking out my contacts later doesn’t become a painful event. Let the pepper infuse into the tequila for 3 hours or more depending on how much heat you want (if you want less you could also use a jalapeno instead). At this point you toss the pepper and keep the tequila in the fridge indefinitely for when you want to use it. Usually I would post pics here but honestly its really just a cut piece of pepper in a bottle so figure you don’t need a visual! For the margaritas first make a simple syrup by combining 2 cups of water and 2 cups of sugar in a saucepan over medium heat. Bring it to a simmer and stir until all of the sugar has dissolved. Let cool (this is a good thing to make in advance as well as it lasts forever in the fridge and simple syrup is great in lots of cocktails and iced coffee). Combine the simple syrup, 2 cups of the lime juice, 2 cups of the spicy tequila, and the Grand Marnier in a large pitcher. 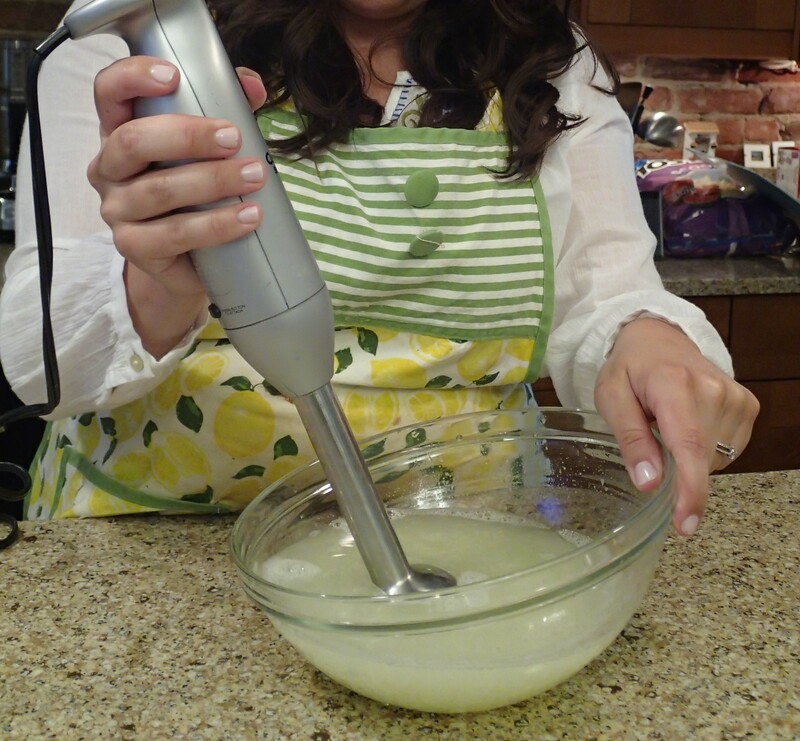 Stir and taste – if it’s too hot you can add lime juice or water to dilute. To make the salt air combine 1 cup of the lime juice, 2 cups of the water, the salt and the soy lecithin in a large bowl. Tilt the bowl so the liquid is at the bottom away from you and use an immersion blender until you create a good layer of foam. 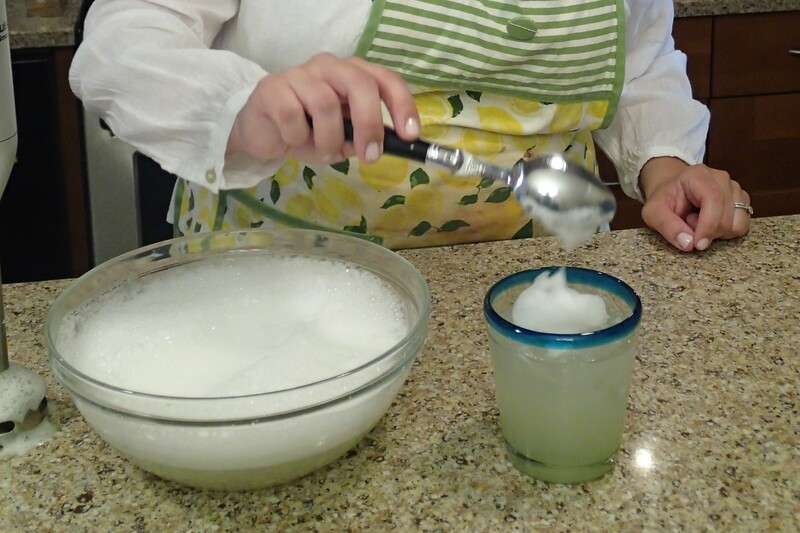 Pour the margaritas into chilled glasses and top with a scoop of foam. If you run out of foam no worries, just blend again to create more. Enjoy! First you want to infuse the tequila – infuse the whole bottle or just pour out 2 cups. Place the cut habanero in the tequila carefully. Let the pepper infuse into the tequila for 3 hours or more depending on how much heat you want (if you want less you could also use a jalapeno instead). At this point you toss the pepper and keep the tequila in the fridge indefinitely for when you want to use it. For the margaritas first make a simple syrup by combining 2 cups of water and 2 cups of sugar in a saucepan over medium heat. Bring it to a simmer and stir until all of the sugar has dissolved. Let cool. Combine the simple syrup, 2 cups of the lime juice, 2 cups of the spicy tequila, and the Grand Marnier in a large pitcher. Stir and taste – if it’s too hot you can add lime juice or water to dilute. To make the salt air combine 1 cup of the lime juice, 2 cups of the water, the salt and the soy lecithin in a large bowl. Tilt the bowl so the liquid is at the bottom away from you and use an immersion blender until you create a good layer of foam. Pour the margaritas into chilled glasses and top with a scoop of foam. If you run out of foam no worries, just blend again to create more.